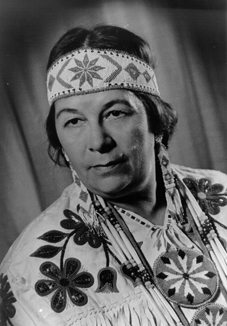 Dorothy Maquabeak Francis was one of Canada’s great aboriginal teachers, marrying her love of Baha’u’llah to her promotion of native culture and identity. A Saulteaux, Dorothy Francis was born on 22 March 1912 and raised on the Waywayseecappo reserve in Manitoba, near the town of Russell. She spent her early married life with her husband, Joseph, on a reserve just outside of Broadview, Saskatchewan. In 1953, one of her nine children died because there were not adequate hospital facilities for aboriginal Canadians, so the family moved to Regina, Saskatchewan. No one there would rent a house to native Canadians with large families, so they ended up pitching a tent on the outskirts of town. At that time, there were fewer than 50 First Nations people in the area. Dorothy Francis became involved in the Regina Native Society and then founded the first Indian Friendship Centre, spending most of her evenings counselling there. The family then moved to Winnipeg, Manitoba, where Dorothy Francis went to work at the Indian Centre, first as an arts and crafts manager, then as a family counsellor. She became an economic development officer and native culture worker, then was elected chair of the National Arts and Crafts Advisory Committee. She also served on the Ontario Arts and Crafts Advisory Board. Dorothy Francis was an artist, and some of her work has been exhibited in the Royal Ontario Museum in Toronto. She also hosted a weekly Native cultural programme for Canada’s national radio network, published a book on native legends, and recorded native lullabies. Dorothy Francis became a Bahá’í in 1960, introduced to the Faith by Angus Cowan, taught by Arthur and Lily Ann Irwin, and invited to join the Faith by John Robarts. Disturbed by the conflict between Native and Christian cultures, and searching for her place and the place of her people in Canadian society, she found that the Bahá’í Faith not only let her keep her identity but nurtured it. She served on several Local Spiritual Assemblies, was elected a delegate to Canada’s Bahá’í national convention several times, and travelled to teach the Bahá’í Faith in many parts of the country. Over the years, she promoted aboriginal culture and identity in a variety of ways. For that work, she was honoured in 1978 by being appointed a member of the Order of Canada. In her later years, despite the effects of a severe stroke, she created and organized a Native spirituality project for British Columbia corrections institutions. She died of a heart attack in New Westminster, British Columbia, on 16 October 1990. * Adapted from Bahá’í World, Vol. 20. 1986-1992, “In Memoriam,” pp. 990-1. Harvey Iron Eagle Saulteaux of the Pasqua Reserve, Saskatchewan, Canada declared as a Baha’i in 1967. His Grandfather was Chief Strong Eagle. Joseph Francis was the husband of Dorothy Franics mentioned above. He declared as a Baha'i in 1960. Nothing more is known of him at this time. Tom Anaquod passed away on Friday December 1, 2006. Tom was a spiritual man, including being one of the first Indigenous Baha'i in Canada. He was also a pipe carrier. Tom was originally from Muscowpetung, Saskatchewan, and was a residential school survivor. His passing is a big loss not only for my family, but for all First Nations as his passing marks the loss of our elders and the burden of our responsibilities and obligations to teach our young, being passed onto the next generation to carry.